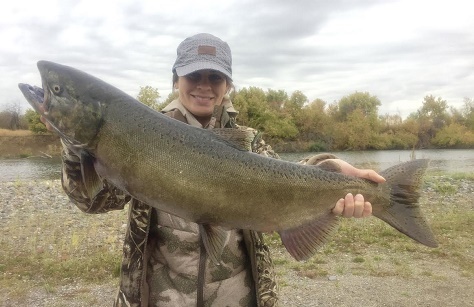 Jonni Smith from Wisconsin holds her first King salmon! 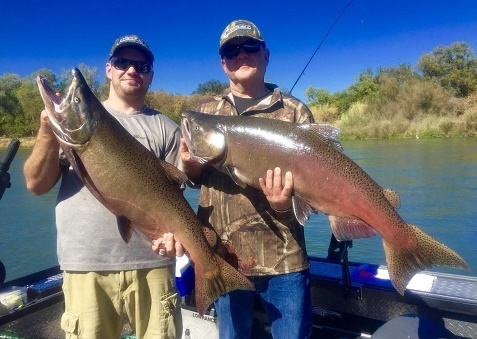 With our fall season in Shasta County now in full swing, we are finding plenty of fishing opportunities on Redding area lakes, and on the Sacramento River. I have spent a lot days on the water this week, and its been a good time to wet a line for many species in our area. In fact, many of my clients this week have caught fish they have never caught before. 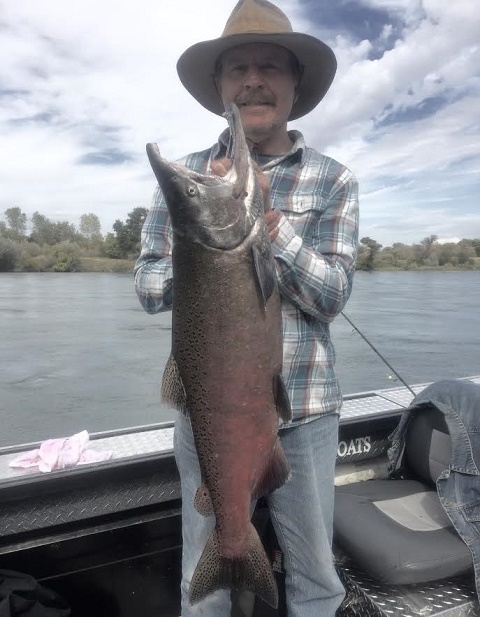 King salmon fishing on the Sacramento River in the Barge Hole area has been tough and only some boats are seeing even one fish per rod. I've fallen short on limits for my boat this week with the exception of a salmon trip I had with two clients on Friday. We were able to haul in 3 King salmon, catch and release a Green sturgeon, and land several rainbow trout. For Nicholas Graham of South Africa, Friday was a childhood dream come true. Nicholas has always wanted to catch a river King salmon. On Friday, not only did he catch one, but he caught two great Sacramento River Kings. It was a great day on the river and I was honored to help fulfill a dream for Nicholas. 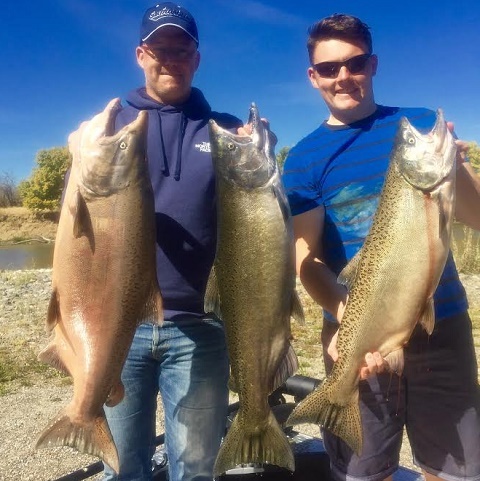 Other trips this week resulted in a salmon for Jonnni Smith of Wisconsin, and a salmon for Dave Barrett of Fresno, Ca. By weeks end, we were catching River rainbows and some late season Kokanee limits as well. All in all, it was a good week for us and its a good thing because change is on the horizon. It looks like a wet weather system is headed our way and by next Thursday we could be seeing some rain. This will likely change the current fishing conditions, and maybe substantially depending on how much rain we do get. Any measurable amount will surely send our salmon up Battle Creek and our fall salmon season my see its final days before we get into our "late fall" salmon season in November. 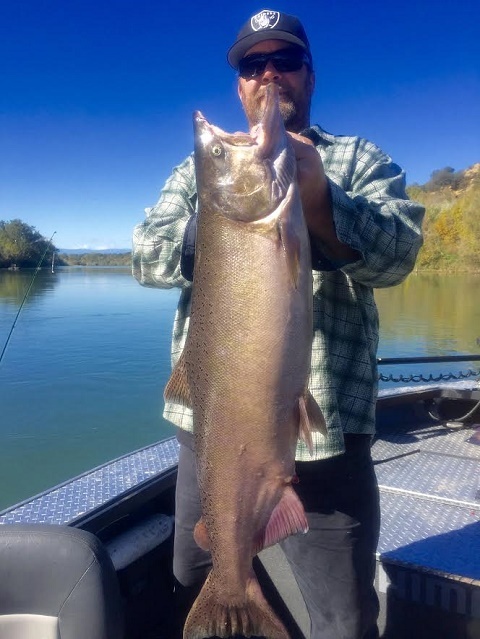 Rain will also send the Whiskeytown Lake Kokanee up into the tributaries to spawn as well, and the Kokanee fishing will surely see its end there for the season. If and when any of this happens, I'll be turning my attention to Shasta Lake where the Spotted bass fishing and trout fishing will likely improve with rainfall and cooler water temps. Until then, I still have a lot of salmon fishing to do through the end of next week so lets hope we don't see to many major changes before my Sac salmon season ends!